Electric vehicles are everywhere now. Even though battery technology hasn’t had the breakthrough that we need to get everyone out driving an electric car, the price for batteries has dropped enough that almost anything else is possible. The hoverboard was proof of this: an inexpensive electric vehicle of sorts that anyone who was anyone in 2015 had. Taking his cue from there, [Harris] used off-the-shelf parts normally used for hoverboards to build his own battery-powered trike. The trike is homemade from the ground up, too. The H-frame was bolted together using steel and lots and lots of bolts. Propulsion comes from a set of hub motors that are integrated into the wheels like a hoverboard or electric bicycle would have. Commonly available plug-and-play lithium batteries make up the power unit and are notably small. In fact, the entire build looks like little more than a frame and a seat, thanks to the inconspicuous batteries and hub motors. There is certainly no shortage of bicycle builds out there on the ‘net. We’re not talking custom race bikes or anything here, we mean cool odd-ball bikes built just because. We’ve seen trike conversions before, both with single wheels in the front and in the back, but today we stumbled across something we haven’t seen before. [Kong79] has built a reverse trike, with 2 wheels in the front. That by itself is nothing new but this trike has an independent front suspension, meaning each wheel can move up and down independently from the other. This particular build uses a double A-arm setup that keeps the axle of the wheel near parallel with the ground throughout its range of travel. The trike started off as a standard mountain bike. The front fork was removed to make way for the new front suspension. There is a new box frame that was welded up and positioned directly below the head tube. This frame will support all 4 A-arms. Speaking of the A-arms, they certainly aren’t off the shelf units. Take a look, the uppers are bike forks and the lowers were welded together from bike frame tubes. The spindles are where it gets a little tricky but [Kong79] made it happen with his resourcefulness. Bike head tubes, head bearings and standard stems make up the spindle components and are responsible for allowing each front wheel to steer. Each spindle is connected to the steering column by a tie rod scrounged from an ATV. The shocks were found at a motorcycle scrap yard. This is a pretty unique build and it’s sure great to see people doing stuff like this. For more trick trikes, check out this wooden one or this no-weld-required recumbent. This tiny little scratch-built electric tricycle is a insanely powerful. Some might think you don’t need a crash helmet for testing a trike, but seeing the video after the break where [Ben Katz] is flying through a parking garage while slaloming between the support beams proves that this ride has some pep to it. Looking through the presentation post linked above is fun, but when we started digging though the six build log posts we felt ourselves getting sucked into the project. It’s a delight every step of the way. It started with an aluminum box which will host the two rear wheels, drive train, motor, and battery. [Ben] decided to go with A123 Lithium cells, and after testing to see how many he could fit in the space available he started making choices on the motor and driver circuit. When he finally got his hands on the actual cells for the project he took on the fascinating process of constructing his own battery. Dozens of them were hot glued, then soldered together before being encased by placing them in soda bottles and hitting the plastic with a heat gun. And we haven’t even gotten into the bicycle hub-gear transmission system, disc brakes, differential, chain-drive, and motor… you see what we mean about sucking you in. Oh, and in case you’re wondering this is not [Ben’s] first electric vehicle build. Last year he was showing off his all terrain scooter. [Kaj] wanted to help out an aging family member by building them an electric tricycle during international Hack Day back on August 11th. He mixed in some reused parts with some new ones and ended up with bike that lets the rider troll other cyclists. Apparently when serious riders see an older man on a trike gaining on them they pedal like mad to make sure they don’t suffer the embarrassment of being passed. But there’s enough power and range to overtake the strongest of non-powered competitors. 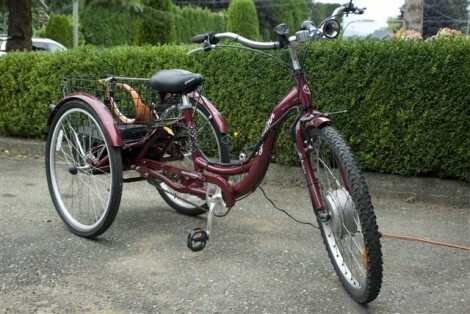 Many of the parts came from a non-functional electric bike sold on Craig’s List. [Kaj] reports that the bike was trashed, but the motor system was mostly salvageable. He replace the batteries and charger and hooked up the motor to the rear axle. The initial install placed everything but the motor in the basket behind the rider. The weight and placement made the thing unstable when cornering. The solution was to house the batteries in a tool box and strap it below the basket. The lower center of gravity makes sure the trike is easy to handle, and now there’s still room in the basket for your groceries. This would make a perfect platform for some road messages printed in water.